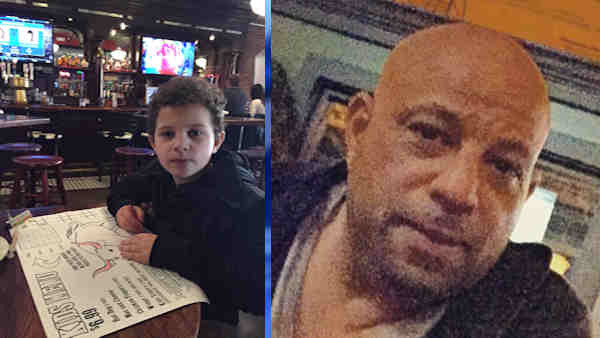 TRUMBULL, Conn. (WABC) -- An Amber Alert has been cancelled in Connecticut and the surrounding areas for Ariel Revello, 7. Connecticut Police say the child has been found and is safe. The father is still at large and the search continues. The father was last seen driving white cargo van with Connecticut plates C040379. The boy was taken from his Unity Road home in Trumbull around 4:30 a.m. Saturday. Police said the child is believed to be in imminent danger. According to the Trumbull Police Department, police responded to the residence after receiving reports of a domestic disturbance. A woman was assaulted in her bedroom after her estranged husband, identified as Rodolfo Revello, 43, forced his way into the home, according to police. Rodolfo at one point got a knife the kitchen, police said, but was disarmed by his 17-year-old stepson. Trumbull Police said that the victim escaped by jumping out her bedroom window and hiding in the yard. Police said Rodolfo took several thousand dollars in cash and jewelry before waking his son, Ariel, and leaving with him in a white Ford van with Connecticut plates CO40379. The suspect is believed to be heading to the New York City area, specifically The Bronx, police said. The victim was taken to the hospital where he was treated for non-life threatening injuries. Police said Ariel is 4 feet 8 inches tall and 75 pounds, and is wearing blue and gray pajamas, an olive green puffy jacket and blue 'Croc' shoes. He has brown hair and brown eyes. Rodolfo Revello is described as a bald Hispanic male with brown eyes. He is about 5 feet 9 inches tall and weighs 190 pounds. Anyone with information is asked to call Trumbull Police Department at 203-261-3665.